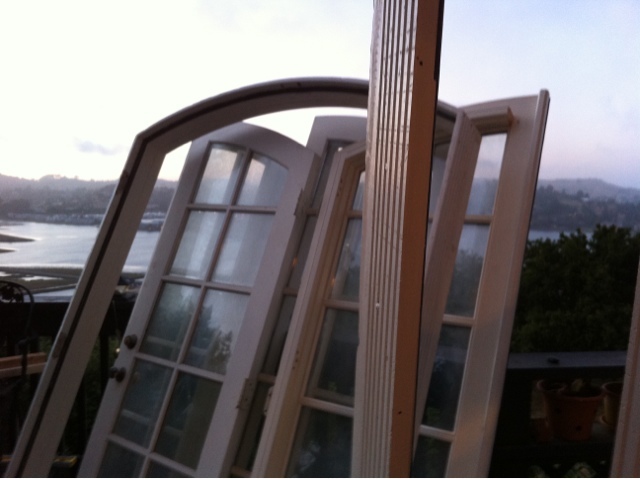 One of the main reasons for creating this upcycled greenhouse is because we get blasted with strong, cold winds late every afternoon. All the years of trying to grow any sort of vegetables, or herbs, was fruitless (pun intended) due to the wind. The greenhouse definitely blocks wind, however because the windows are recycled from a house, they've been treated to guard against sunlight. So we've installed a couple of grow lights. Our temps get cold at night, however it typically warms up for a few hours in the afternoon, so the heartier plants go outside for direct sunlight, weather permitting. 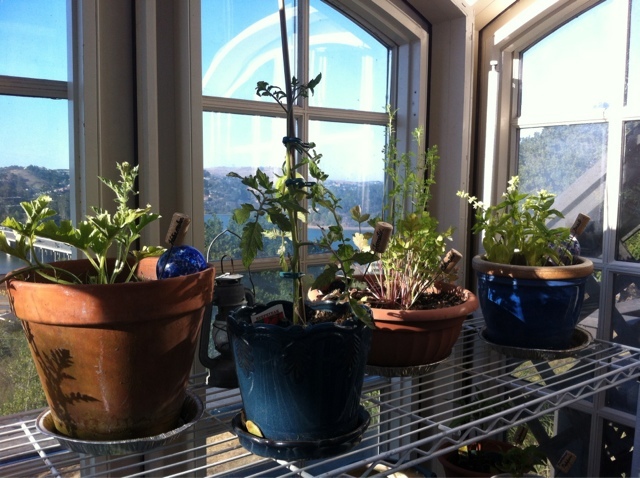 The smaller herbs are faring quite well under just the growlights, so they're definitely working! The roof is now in place and is water-tight. 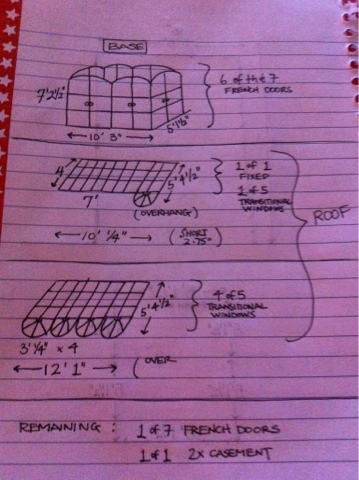 Many thanks to @TrixieThePug's favorite Uncle, The Architect, for our roof! Now that the interior roof trusses are painted (many thanks to @TrixieThePug's next favorite Uncle, The Carpenter for constructing the amazing trusses), we've started to replant some vegetables and herbs as last year's batch was lost from the wind, since it took a while to get the roof on. We're starting slow, with a large tomato plant, red and yellow bell peppers, a blueberry plant, jalapeño and Anaheim peppers, and cilantro. 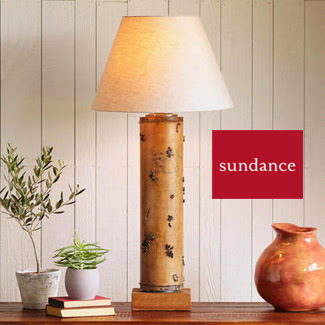 Several organic seeds were purchased, and various more plants will be incorporated once the whole light situation is fully resolved. We have a roof! No more rain falling into our greenhouse. 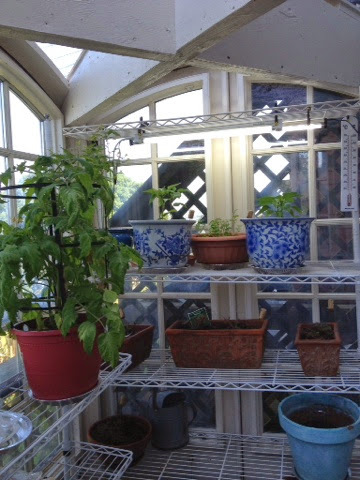 Now we have to figure out light for the plants, since the windows are treated to keep light out. We've installed a couple of growlights, which seem to work. The winds off the ocean & Marin Headlands are brutal every day around 4-4:30pm, so the greenhouse is perfect to block the wind. These shots were taken before the interior trusses got their second coat of paint. 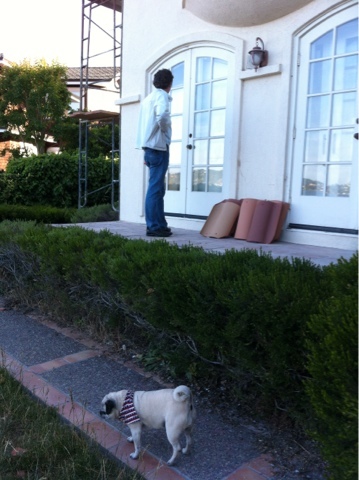 Here @TrixieThePug's uncle, The Carpenter, customizes the roof joints for the #greenhouse. The smell of fresh sawdust was actually wonderful! 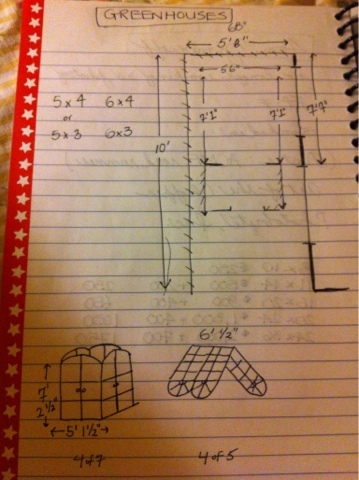 @TrixieThePug's uncle The Carpenter made these awesome roof joints for the #Greenhouse. I was anticipating something much smaller and these are simply incredible!!! Yeah! We finally have the base completed of our #greenhouse project. 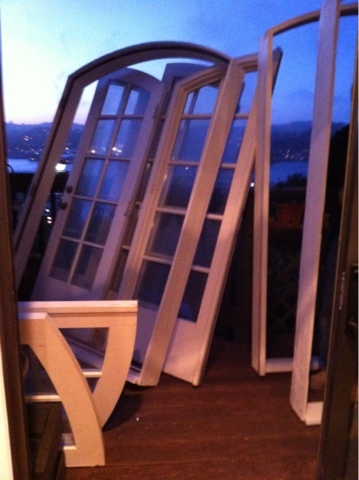 Thus far we've recycled four (4) pairs of French doors and their frames that were heading to the Marin County dump. 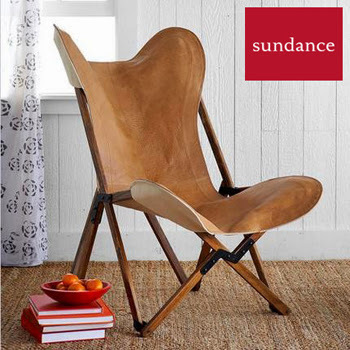 They are 22+ years old, and were weathered from the salt air of the San Francisco Bay. Now they are repainted and hung, awaiting a roof. Voila! 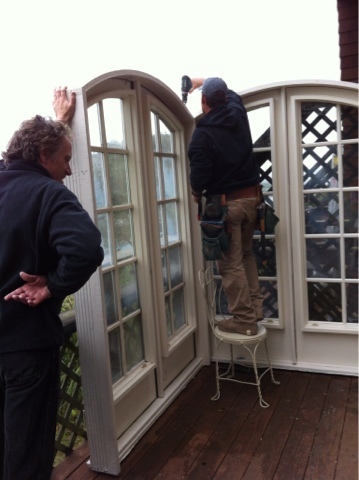 @TrixieThePug's favorite uncles, The Carpenter and The Architect, hang the last of the gorgeous French doors that will be the entrance to our new #greenhouse! 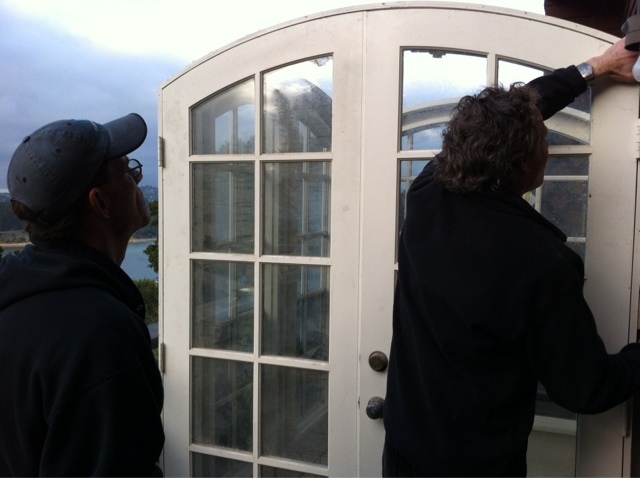 Here @TrixieThePug's favorite uncles, The Carpenter and The Architect, are hanging the last of the gorgeous French doors that will be the entrance to our new #greenhouse! Very exciting to see the final doors of the #greenhouse going in to place! 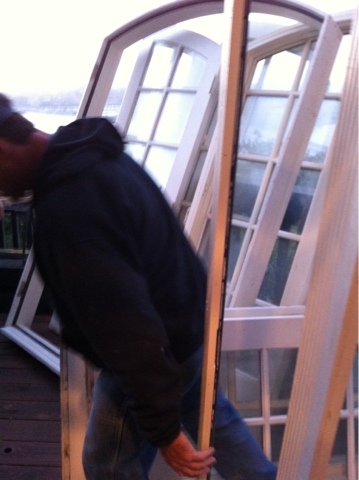 Another evening and a Drumroll: The Carpenter and The Architect putting up the third wall of the #greenhouse! 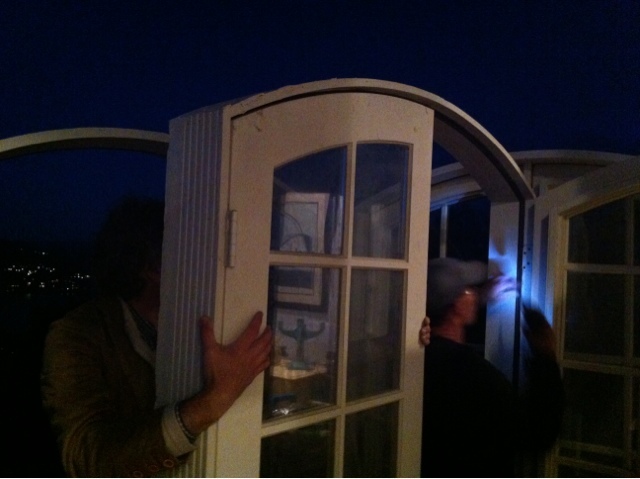 @TrixieThePug's favorite uncles, The Carpenter and The Architect, installing some of the French doors to the newly attached frames as the sun was going down. Uncle Carpenter has this awesome drill that has a built-in light that illuminates where he is drilling. 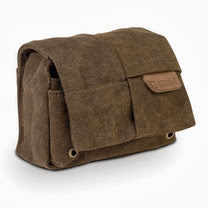 Pretty slick! 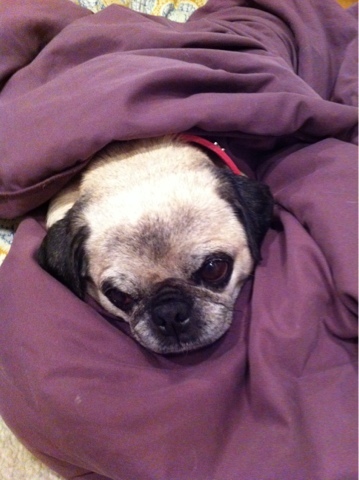 @TrixieThePug, of course, was supervising, snuggled in her puggy bed with her down comforter. 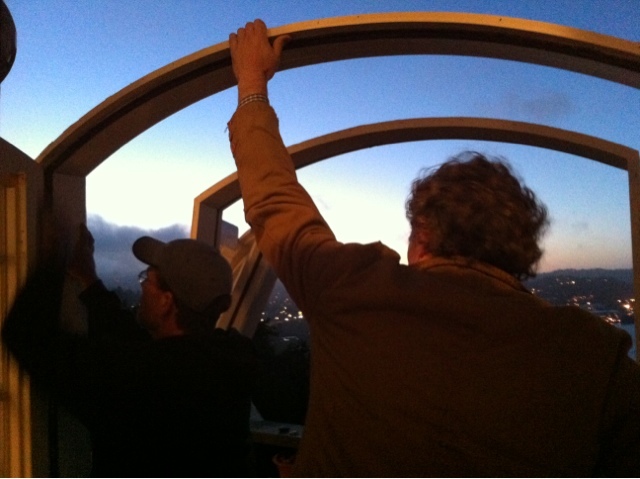 @TrixieThePug's favorite uncles, The Carpenter and The Architect, worked well together attaching the frames as the sun was going down and the fog was rolling in over Mt. Tamalpais. As @TrixieThePug's uncles, The Carpenter and The Architect, were working to attach the frames and hang the doors, I was documenting the process, and making a nice steak dinner for us to enjoy afterwards. The sky was beautiful, making for some great, dramatic shots. 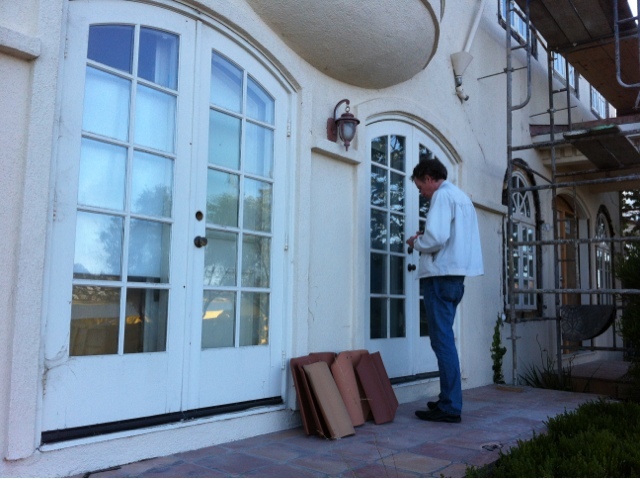 On another Friday evening, the remaining French doors were delivered after the frames were cleaned, treated, primed, and painted. 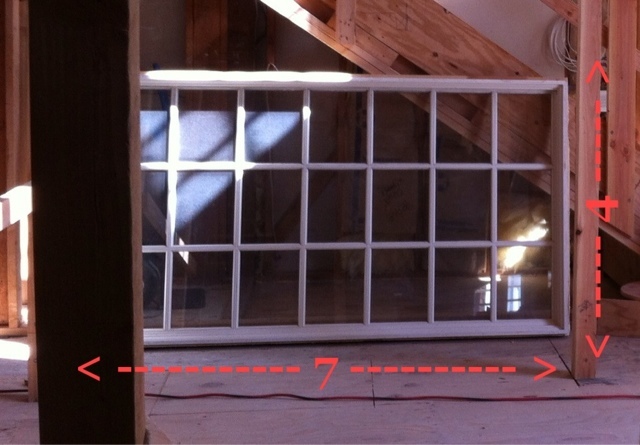 Now the work of attaching the frames and hanging the doors can begin in earnest. 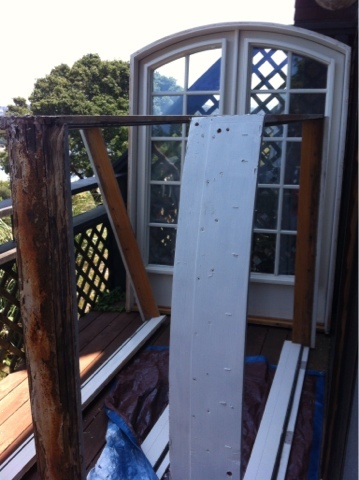 @TrixieThePug's uncle, The Architect, installed spacers on the bottom of the frames, after they were painted, to protect the deck. The spacers act to raise the frames up off the deck, allowing moisture and air to flow, thus not damaging the wooden deck with condensation. Cool concept I wasn't aware of before! 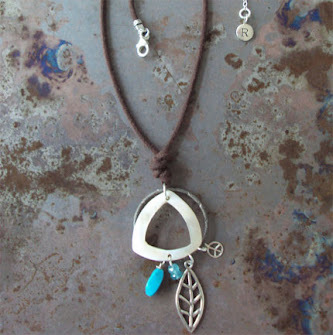 A project like this definitely teaches you a thing or two! 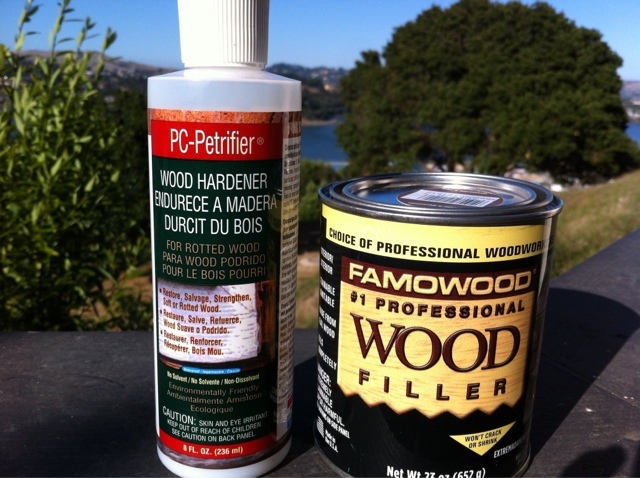 Both the wood hardening agent and the putty filler seem to work fairly well. As @TrixieThePug 's uncle, The Architect, pointed out, this is a #greenhouse and the important thing is that we stopped the wood rot! The before-and-after comparison is pretty neat, in my estimation. Super close-up of the wood rot. 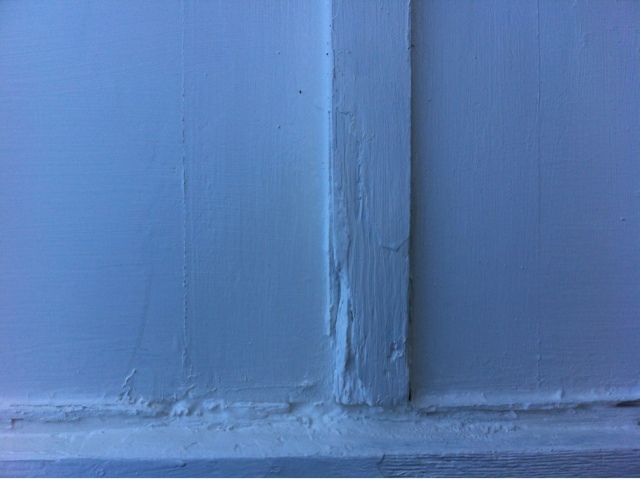 The blueish color is the wood hardening agent that pooled after its first application. That whole area flaked away like sawdust, and is fairly deep. Glad that we are treating it! It's a pretty ingenious process, and I'm glad I learned a new skill. So, apparently this is one way to tackle wood rot. It'll take a couple of days, so let's see how this works. Apparently there is also an injectable solution that can be applied with a syringe, however this seemed more appropriate due to the gaping hole left by the flaking wood. This delay will give me time to work on my blog of this project! 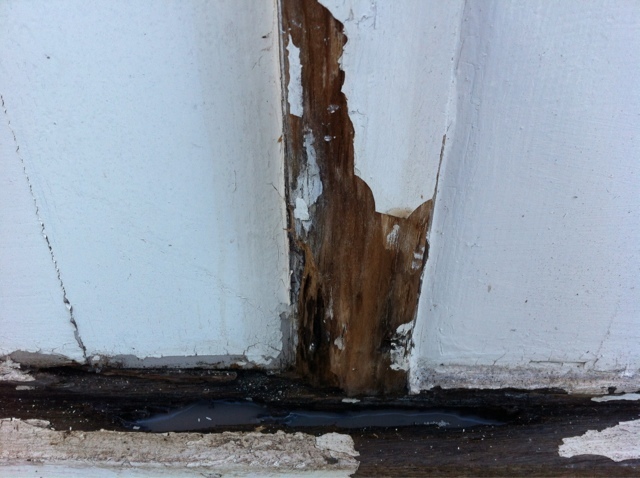 Close-up of the wood rot. 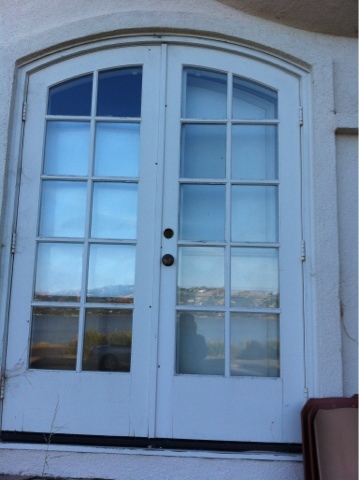 These windows came from a house built right on the San Francisco Bay, with exposure to salt air. 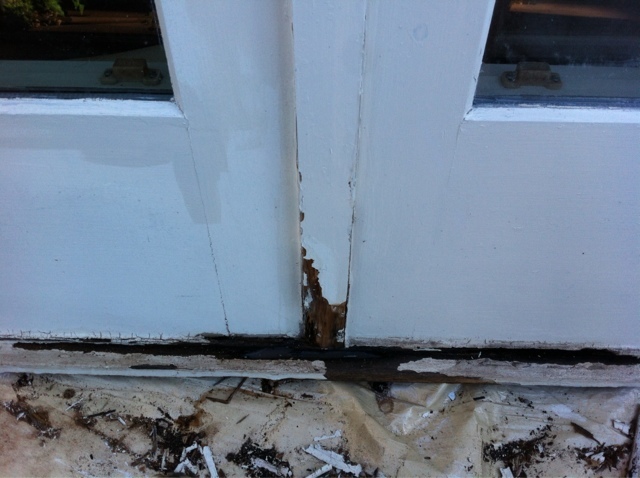 Fortunately only one of the sets of French doors for the #greenhouse has this damage. Ah, wood rot! 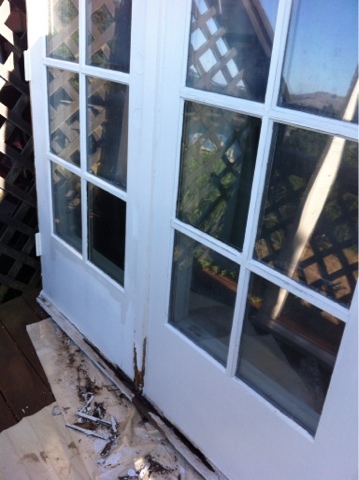 These windows came from a house built right on the San Francisco Bay, with exposure to salt air. And their new outdoor home is about 1-mile above sea-level. 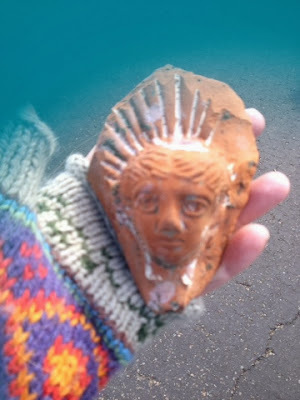 Time to halt painting & start researching how to tackle this! First coat of exterior paint going on... Notice the residual hardwood floor that is part of the base. First coat of exterior paint going on the frames... My job as The Artist was to clean, primer, and paint the frames and doors. Fortunately I love painting! 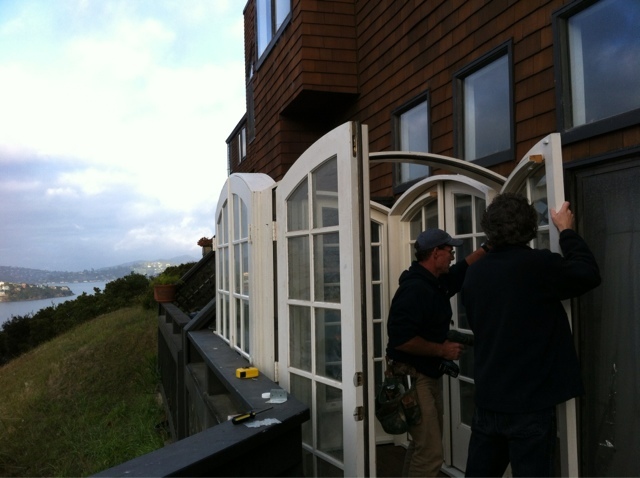 Initially only the frames were delivered, with one set of the French doors. 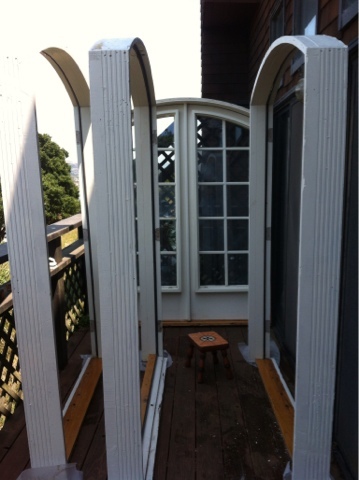 It was my task as The Artist to paint them before they were put together as a #greenhouse. One Friday evening 1-pair of the French doors and all the frames arrived, delivered by @TrixieThePug's uncle, The Carpenter! 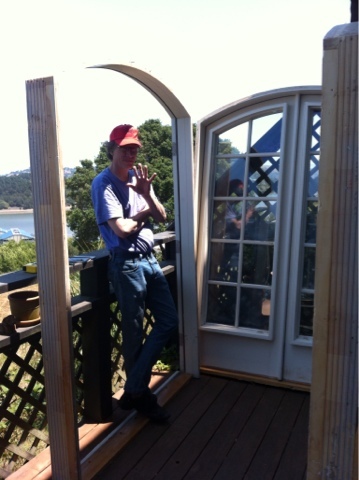 Trixie's other uncle, The Architect, helped loading the doors and frames to our back deck. Trixie and I helped where we could, but mostly stayed out of the way, while documenting the process. Trix and I made dinner that we all enjoyed after the heavy lifting was over. 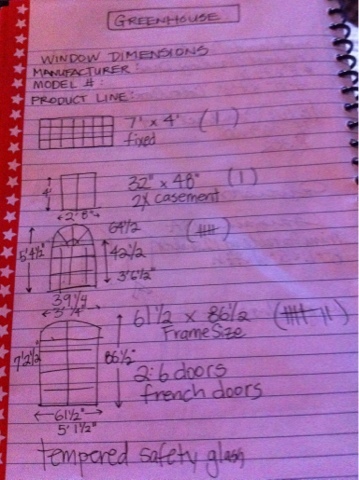 An inventoried note of the various French doors and windows, their dimensions, and sizes, prior to their removal from their original home. 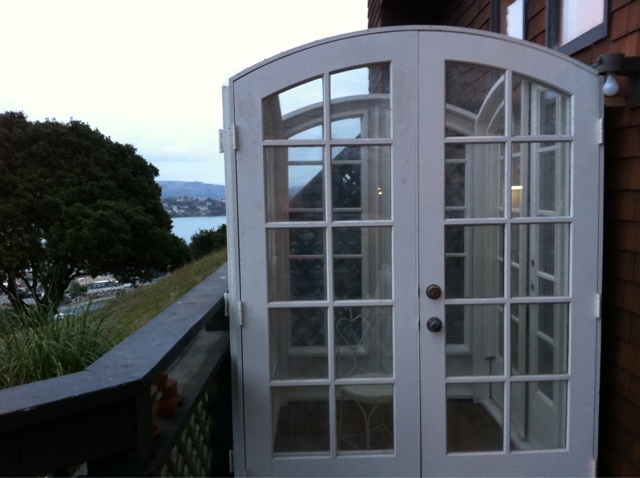 How the French doors looked at their original location on the San Francisco Bay. 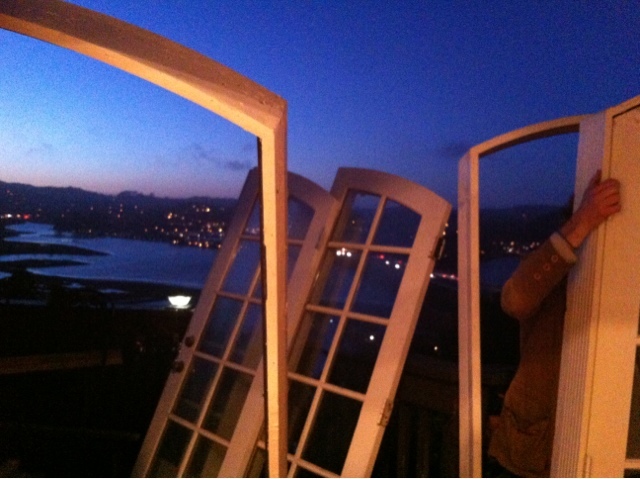 In this shot you can see the Bay across the street reflected in the glass. 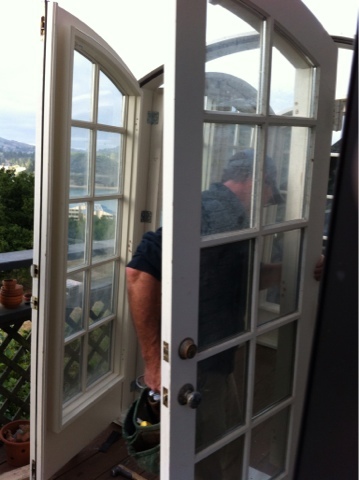 @TrixieThePug's uncle, The Architect, examining the exterior French doors in their original location. 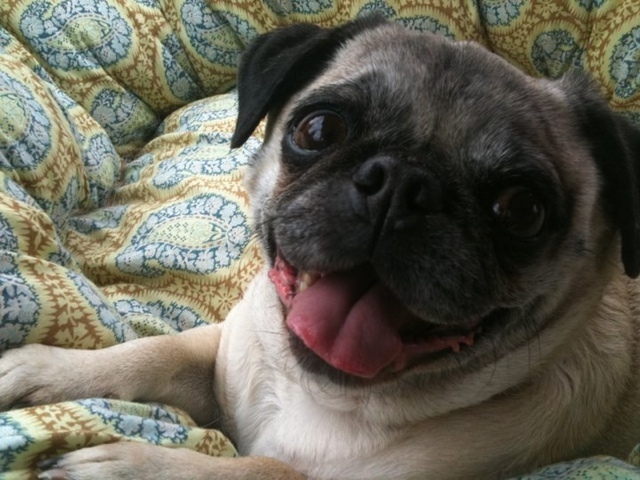 This whole project started because @TrixieThePug loves men -- especially men with food -- and one day on our daily walk she ran up to a group of construction workmen on their lunch break! It turned out that the jobsite foreman who is a General Contractor (a.k.a. The Carpenter), has a pug (Pugsley) and a Bassett hound (Eddie), so Trixie would run over every time we'd be out for a stroll to get petted by her new uncle.